Cosmetic Networks host Sheila Maitlen interviews Laguna Niguel Dermatologist, Dr. Lorrie Klein on Cosmetic Networks Live Web Show. Sheila Maitlen: Dr. Klein, what are your top four favorite products in the Teoxane line and why? 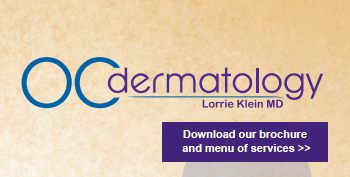 Dr. Lorrie Klein: My favorite product is the Repair Balm. That’s my first favorite because that’s the one that I put on all my filler patients afterwards. It helps immediately with bruising and swelling. And then, if they take it home with them, they can also use it for a week or two after their treatments and even a week or two before their next treatments to help the bruising and swelling from the filler injection. My patients love the Repair Balm. It also smells great. My next favorite one is the Teoxane Refiner because it’s got 10% glycolic acid in it, which is great for exfoliation. My other two favorites are the Advanced, which is a moisturizer, and the serum, which is like a super-duper hydrator. I often recommend a sandwich of products. I recommend SkinMedica Essential Serum, which is one of my other favorite products, and then a layer of the Teoxane serum and a layer of either the Advanced or the Refiner of Teoxane’s line, then on top of this a sunscreen, all of which makes a nice sandwich of hydration and rejuvenation. Sheila Maitlen: Is it important to know the order in which these products should be administered to your skin? Dr. Lorrie Klein: Absolutely. For instance, SkinMedica Essential Serum, because of its growth factor, needs to be applied first. Growth factor should always be applied first because they will be deactivated by other products if the products are not put on in the right order. And then the last thing that should go on should always be something heavier, like your moisturizer or your sunscreen, and in between the other products.